I have a sweet spot for, well, anything sweet this time of year. That being said, my waistline does not appreciate the extra indulgences. Or rather, my jeans don't. So to find a happy medium, I turn to lighter recipes with healthier substitutes to tame my sweet tooth. 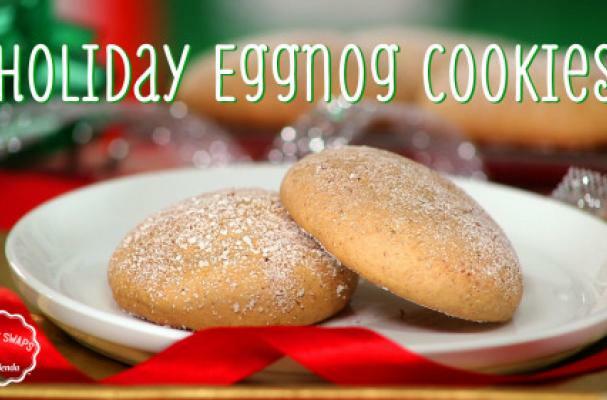 These eggnog cookies are only 80 calories a pop and packed with holiday cheer. While the recipes calls for no calorie sweetener, it does not skip on the butter so you are not missing out on flavor or texture. Have you used alternative sweeteneres in baking before? How did the recipe turn out? Let us know in the comment section below. Step 1: In a medium-size bowl, combine flour, baking soda, cinnamon, nutmeg, and salt. Step 2: In a larger bowl, stir together butter, egg, vanilla, and rum extract. Stir in SPLENDA® No Calorie Sweetener, Granulated and SPLENDA® Brown Sugar Blend until completely dissolved. Add flour mixture to butter mixture and stir until combined. Step 3: Place dough in the refrigerator and chill for approximately 30 minutes. Step 4: Preheat oven to 350°F and line a baking sheet with parchment paper. Step 5: For the topping: In a separate bowl combine the SPLENDA® No Calorie Sweetener, Granulated, cinnamon, and nutmeg. Step 6: Roll dough into 1-inch balls and place onto the baking sheet. Flatten with hand and sprinkle with approximately 1/4 teaspoon of the topping mixture. Step 7: Bake for 9-12 minutes. Allow to cool on the baking sheet for about 10 minutes before moving them to a cooling rack. Serve and enjoy!